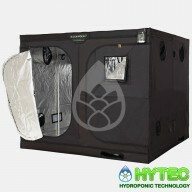 These completely enclosed grow tents are designed to be free standing grow rooms and are suitable for domestic use. They help to create and achieve optimum growing climates and come in a range of sizes . 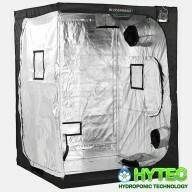 BLOOMROOM 1.2m x1.2m x 2.0m Our completely enclosed grow tents are designed to be free standing grow rooms and are suitable for domestic use. 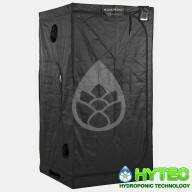 They help to create and achieve optimum growing climates and come in a range of sizes. 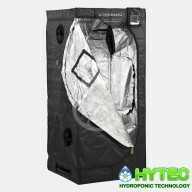 100% Lightproof Mylar Heavyduty Material and Zips Strong M..
BLOOMROOM COMPACT 0.8 X 0.8 X 1.8 SKIN Material - 600*300D VENTILATION HOLE POINTS Roof - 1 x 8” Top - 2 x 8” Bottom - 2 x 8” Cable Holes - 3 x 4” Passive Intake Vents - 1 x 35cm x 15cm Up-Lift Bar Ports - 1 x 40cm x 10cm DOORS AND WINDOWS Door Placement - 1 x Large Front Door..
BLOOMROOM MEDIUM 1.0 X 1.0m X 2.0m Tent Dimensions - 1.0m x 1.0m x 2.0m SKIN Material - 600*300D VENTILATION HOLE POINTS Roof - 1 x 10” Top - 2 x 10” Bottom - 2 x 8” Cable Holes - 3 x 4” Passive Intake Vents - 1 x 35cm x 15cm Up-Lift Bar Ports - 1 x 40cm x 10cm DOORS AND WIN..
BLOOMROOM TOWER STANDARD. 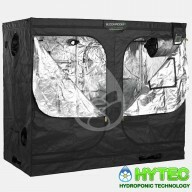 SPECIFICATIONS Tent Dimensions; 1.2m (W) x 1.2m (L) x 2.35m (H) Material 6 00*300D VENTILATION HOLE POINTS Roof 1 X 10" Top 2 x 10” Bottom 2 x 8” Cable Holes 3 x 4” Passive Intake Vents 1 x 35cm x 15cm Up-Lift Bar P..
BLOOMROOM STANDARD PLUS 1.5m X 1.5m X 2.0m Tent Dimensions - 1.5m x 1.5m x 2.0m SKIN Material - 600*300D VENTILATION HOLE POINTS Roof - 1 x 12” Top - 2 x 12” Bottom - 2 x 8” Cable Holes - 3 x 4” Passive Intake Vents - 1 x 35cm x 15cm Up-Lift Bar Ports - 2 x 40cm x 10cm DOORS ..
BLOOMROOM MEDIUM PLUS Tent Dimensions - 2.0m x 1.0m x 2.0m SKIN Material - 600*300D VENTILATION HOLE POINTS Roof - 2 x 14” Top - 2 x 12” Bottom - 2 x 10” Cable Holes - 5 x 4” Passive Intake Vents - 2 x 35cm x 15cm Up-Lift Bar Ports - 4 x 40cm x 10cm DOORS AND WINDOWS Door Placeme..
BLOOMROOM LARGE 2.4m X 1.2m X 2.0m SKIN Material - 600*300D VENTILATION HOLE POINTS Roof - 2 x 14” Top - 2 x 12” Bottom - 2 x 10” Cable Holes - 5 x 4” Passive Intake Vents - 2 x 35cm x 15cm Up-Lift Bar Ports - 4 x 40cm x 10cm DOORS AND WINDOWS Door Placement - 2 x Large Front Doors,..
BLOOMROOM TOWER LARGE. SPECIFICATIONS Tent Dimensions; 2.4m (W) x 2.4m (L) x 2.35m (H) Material 6 00*300D VENTILATION HOLE POINTS Roof 2 x 14” Top 4 x 12” Bottom 2 x 10” Cable Holes 5 x 4” Passive Intake Vents 2 x 35cm x 15cm Up-Lift Bar Ports 4 x 40cm x 1..
BLOOMROOM TOWER XL. 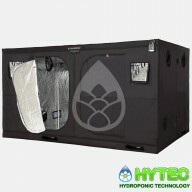 SPECIFICATIONS Tent Dimensions; 2.0m (W) x 2.0m (L) x 2.35m (H) Material 6 00*300D VENTILATION HOLE POINTS Roof 2 x 14” Top 4 x 12” Bottom 2 x 10” Cable Holes 5 x 4” Passive Intake Vents 2 x 35cm x 15cm Up-Lift Bar Ports 4 x 40cm x 10cm..
BLOOMROOM XL 2.0m X 2.0m X 2.0m SKIN Material - 600*300D VENTILATION HOLE POINTS Roof - 2 x 14” Top - 2 x 12” Bottom - 2 x 10” Cable Holes - 5 x 4” Passive Intake Vents - 2 x 35cm x 15cm Up-Lift Bar Ports - 4 x 40cm x 10cm DOORS AND WINDOWS Door Placement - 2 x Large Front Doo..
BLOOMROOM LARGE PLUS 3.0m X 1.5m X 2.0m SKIN Material - 600*300D VENTILATION HOLE POINTS Roof - 2 x 14” Top - 2 x 12” Bottom - 2 x 10” Cable Holes - 5 x 4” Passive Intake Vents - 2 x 35cm x 15cm Up-Lift Bar Ports - 4 x 40cm x 10cm DOORS AND WINDOWS Door Placement - 2 x Large F..
BLOOMROOM XL PLUS 3.0m X 2.0m X 2.0m SKIN Material - 600*300D VENTILATION HOLE POINTS Roof - 2 x 14” Top - 4 x 12” Bottom - 2 x 10” Cable Holes - 5 x 4” Passive Intake Vents - 2 x 35cm x 15cm Up-Lift Bar Ports - 4 x 40cm x 10cm DOORS AND WINDOWS Door Placement - 2 x Large Front Door..
BLOOMROOM JUMBO 2.4m X 2.4m X 2.0m SKIN Material - 600*300D VENTILATION HOLE POINTS Roof - 2 x 14” Top - 4 x 12” Bottom - 2 x 10” Cable Holes - 5 x 4” Passive Intake Vents - 2 x 35cm x 15cm Up-Lift Bar Ports - 4 x 40cm x 10cm DOORS AND WINDOWS Door Placement - 2 x Large Front ..
BLOOMROOM TOWER GIANT. SPECIFICATIONS Tent Dimensions; 2.4m (W) x 2.4m (H) x 2.35m (H) Material 6 00*300D VENTILATION HOLE POINTS Roof 2 x 14” Top 4 x 12” Bottom 2 x 10” Cable Holes 5 x 4” Passive Intake Vents 2 x 35cm x 15cm Up-Lift Bar Ports 4 x 40c..
BLOOMROOM GIANT 3.0m X 3.0m X 2.0m VENTILATION HOLE POINTS Roof - 2 x 14” Top - 4 x 12” Bottom - 2 x 10” Cable Holes - 5 x 4” Passive Intake Vents - 2 x 35cm x 15cm Up-Lift Bar Ports - 4 x 40cm x 10cm DOORS AND WINDOWS Door Placement - 2 x Large Front Doors, 2 x Large Rear Doors ..
BLOOMROOM TOWER GIANT. 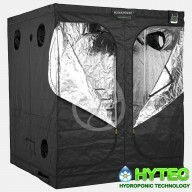 SPECIFICATIONS Tent Dimensions; 3.0m (W) x 3.0m (L) x 2.35m (H) Material 6 00*300D VENTILATION HOLE POINTS Roof 2 x 14” Top 4 x 12” Bottom 2 x 10” Cable Holes 5 x 4” Passive Intake Vents 2 x 35cm x 15cm Up-Lift Bar Ports 4 x 40cm x 1..
Bloomroom Colossal 6.0m x 3.0m x 2.0m Our completely enclosed grow tents are designed to be free standing grow rooms and are suitable for domestic use. 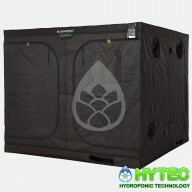 They help to create and achieve optimum growing climates and come in a range of sizes. 100% Lightproof Mylar Heavyduty Material a..